Being a part of the community is important to each of us. The community allows us the opportunity to develop friendships and a connection to where we live. It gives us a sense of belonging and improves our quality of life. Often people with disabilities do not have the same opportunities to participate in the community as "normal" people for many reasons; no transportation, lack of safety skills, unfamiliarity, little or no communication and social skills, etc. The Community Unity Program provides instructional programs and community involvement so that program participants have the opportunity to experience all things a community has to offer. 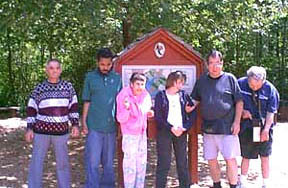 Participants have the opportunity to participate in at least two community trips of their choice per week. Transportation for the field trips is provided by SUNCOM. A Coordinator and Assistant lead the group. The Program Coordinator is responsible for coordinating community outings, giving feedback to the community projects, creating programs to enhance participants' interpersonal skills, providing educational programs, overseeing the entire program and supervising the assistant. The assistant provides leisure skills training and instructs educational classes, daily orientation, arts and crafts. 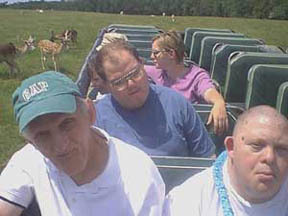 He or she also assists on outings and daily needs of the program. The Director of Rehabilitation is responsible for overseeing the entire program. Programming consists of interpersonal skill development, educational programming, community exposure, leisure and safety skills development, fun, fun, and more fun.